Nike designer Tinker Hatfield reminds us that Marty McFly's self-lacing sneakers are still on track for this year. 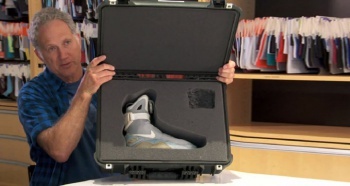 Early last year, Nike revealed to us that the future is coming by announcing that Marty McFly's self-lacing sneakers from Back to The Future Part II were a thing that they were actually making. Then, we didn't really hear anything about them for a year, but now, AGENDA Emerge conference, Nike designer Tinker Hatfield assures us his team is still hard at work on the laces, and we will most likely see them before the year's end. When asked for a specific release date, the designer simply said that there are still "11 and two-thirds months left in 2015″, strongly hinting that the laces will come out this year. Back to The Future fans will note that 2015 is, whether by co-incidence or deliberate planning, the year that Marty visits in Back to The Future Part II. Specifically, he arrives on October 21, 2015, so Hatfield's words, along with the milestone, gives us reason to believe that they will probably tie the release of the laces in with Marty's fictional "arrival date".